Miriam also has a very special ability — she can foresee the manner in which a person will die and know exactly when, down to the very micro-second. All she needs is any skin-on-skin contact and the visions will trigger, the deaths playing out in her mind in their entirety but lasting only a couple seconds to anyone watching from the outside. She used to care, used to want to save others from their preventable demises, but quickly learned her lesson: What fate wants, fate gets. Now she’s a vagrant, hopping from city to city trailing those she knows will soon meet their end, so she can swoop in and rob them at the time of their deaths and no one will be the wiser. Then one day she meets Louis, the random truck driver who gives her a lift and is the first person in a long time to show her even a hint of kindness. She finds she likes him, but then she shakes his hand and sees his death — in 30 days, Louis will be brutally murdered. Miriam is shocked; she’s seen hundreds of deaths from accidents, suicides, and health problems, but very rarely has she seen murder. And the kicker is, in her vision right before Louis dies, he looks up past his killer and calls Miriam’s name…like he sees her there. It was difficult to put this book down. Obviously, the plot being such a tease was a major draw, but like I said before, I was also very much taken with Miriam. I still don’t know why, really; it’s not like I can relate to her all that easily since I am nothing like her, but I felt connected to her regardless. She’s definitely unique, and it’ll be a mistake going into this book expecting her to be just another independent, tough-as-nails paranormal fiction female protagonist. Miriam would probably just beat someone like her up, but only after cussing her out and drinking her under the table. A lot of the criticisms I’ve seen directed at this book claim Miriam’s character doesn’t read like a “real girl”, but I have to disagree. Not only do I know women who act just like Miriam, I also think that her rough, trashy badass exterior reflects the kind of life she’s had growing up with her disturbing power, making her behavior and personality convincing and refreshingly honest. At the same time, I sense that underneath is someone more perceptive and complex, with a introspective, kind and caring side to her that you just have to dig a little bit beneath the surface to find. Okay, maybe make that dig A LOT beneath the surface, but I still know it’s there. This book also made me start appreciating Chuck Wendig’s style a lot more than I had before. His writing, topics, and characters are infused with this attitude which to me is a little reminiscent of the transgressiveness in books one might find by authors like Chuck Palahniuk or Bret Easton Ellis. I also love the paranormal spin to Blackbirds, but I would also hesitate to categorize it as urban fantasy because it throws so many of that genre’s conventions out the window; my guess is that a person can be really put off by this book if caught completely unprepared by it. Sometimes, it does feel like the book is deliberately out to shock you, what with some of its violent and graphic scenes as well as Miriam’s potty mouth, but I was strangely cool with it. The subject matter also had a way of making me feel deliciously unsettled, but it at least made this book memorable. 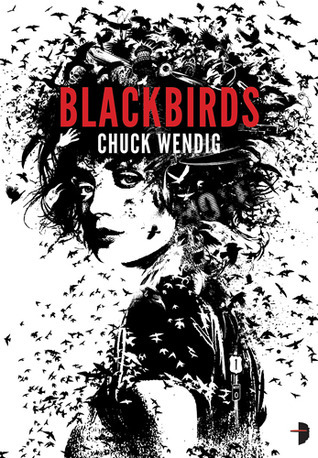 I admit I was somewhat initially hesitant about tackling another Chuck Wendig book after enjoying but not being completely blown away by The Blue Blazes, but I definitely liked Blackbirds more than I thought I would.